If you are looking for a professional style wheel on a budget, this 18 Inch ABS Acrylic Wheel - Steel Spinner is for you (includes two professional roulette balls. Our 18 inch ABS wheel uses the same professional metal spinner as the 19 inch wood wheel. 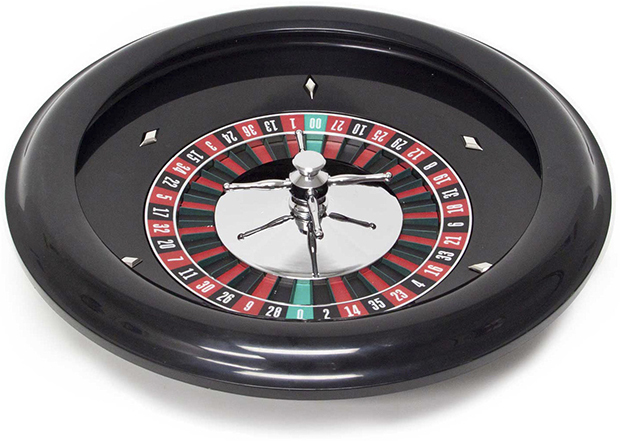 This wheel is perfectly suited for casino night companies and home game rooms alike. This wheel can be flush mounted or set on top of your table. Packed securely in a full color retail box. This is the best quality wheel you can buy without spending at least twice the money! It is quality manufactured of a tough high-gloss ABS plastic for high volume use. The wheel is professionally balanced and mounted on a steel linear ball bearing movement for smooth, reliable action! This is the same action and same 10" cast aluminum spinner as used on our 19" Mahogany Wheel. This wheel features multi-color ball pockets, chrome plated spinner and quality built to last!